Western blot analysis of extracts from various cell lines using ADAM10 Antibody. Immunoprecipitation of ADAM10 from ACHN cell extracts using Normal Rabbit IgG #2729 (lane 2) or ADAM10 Antibody (lane 3). Lane 1 is 10% input. 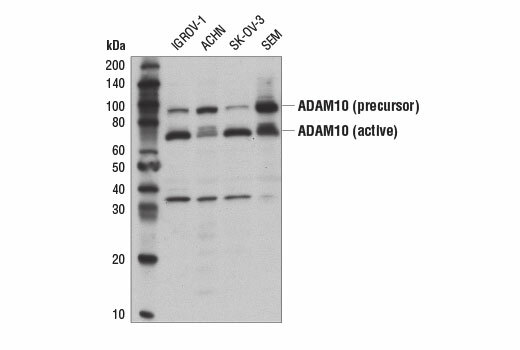 Western blot analysis was performed using ADAM10 Antibody. 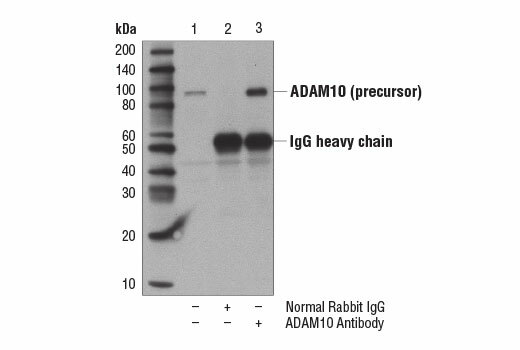 ADAM10 Antibody recognizes endogenous levels of total ADAM10 protein, including the active, mature 68 kDa protein and the 90 kDa precursor chain. The antibody also recognizes a 35 kDa protein of unknown origin. Polyclonal antibodies are produced by immunizing animals with a synthetic peptide corresponding to residues near the carboxy terminus of human ADAM10 protein. Antibodies are purified by protein A and peptide affinity chromatography. Members of the ADAM (a disintegrin and a metalloprotease) family of multidomain membrane proteins influence cell signaling and adhesion by shedding cell surface proteins, such as cytokines and growth factors. This process influences cell-extracellular matrix (ECM) adhesion and ECM remodeling. Conserved domains found in most ADAM family proteins include a prodomain, a zinc-dependent metalloprotease domain, a disintegrin domain, a carboxy-terminal cysteine-rich domain, an EGF-like sequence, and a short cytoplasmic tail (1,2). The ADAM metallopeptidase domain 10 (ADAM10) is a plasma membrane proteinase that cleaves membrane-bound proteins targeted for regulated intramembrane proteolysis (RIP). The ADAM10 prodomain acts as a chaperone that stabilizes mature ADAM protein folding, and prevents target-protein shedding through inhibition of ADAM10 proteinase activity (3,4). Mature ADAM10 is the major α-secretase responsible for cleavage of Notch, APP, cadherins, and prion protein (5-7). The ADAM10 protein cleaves receptor tyrosine kinases and their associated ligands and displays a wide range of regulatory functions across related signaling pathways (8). Research studies using knockout mice demonstrate that loss of ADAM10 results in defects in cortex formation, lymphocyte development, and cardiovascular development (9-11). Increased ADAM10 protein expression correlates with progression of many types of cancer (i.e. gastric cancer, hepatocellular carcinoma, and brain glioma), due to increased cancer cell migration, metastasis, and invasion (12-14). Mutations in the corresponding ADAM10 gene result in a rare, autosomal dominant pigmentation disorder known as reticulate acropigmentation of Kitamura (15). Turner, A.J. and Hooper, N.M. (1999) Biochem Soc Trans 27, 255-9. Edwards, D.R. et al. (2008) Mol Aspects Med 29, 258-89. Suh, J. et al. (2013) Neuron 80, 385-401. Moss, M.L. et al. (2007) J Biol Chem 282, 35712-21. Hartmann, D. et al. (2002) Hum Mol Genet 11, 2615-24. Miller, M.A. et al. (2013) Proc Natl Acad Sci U S A 110, E2074-83. Reiss, K. et al. (2005) EMBO J 24, 742-52. Endres, K. et al. (2009) Neurobiol Dis 36, 233-41. Jorissen, E. et al. (2010) J Neurosci 30, 4833-44. Zhang, C. et al. (2010) Dev Dyn 239, 2594-602. Gibb, D.R. et al. (2011) Mol Immunol 48, 1319-27. Wang, Y.Y. et al. (2011) J Surg Oncol 103, 116-23. Yuan, S. et al. (2013) Oncol Rep 30, 1715-22. Bulstrode, H. et al. (2012) Cancer Lett 326, 79-87. Kono, M. et al. (2013) Hum Mol Genet 22, 3524-33.